I have made some decent progress on scaling Perenthia down and re-tooling it for more basic HTML/mobile access. I have the server core complete and am working on the UI components. The first step will be to get the adventuring/combat piece finished and then move on to the crafting system. The abstract core server pieces I decided to put into a separate library and made the source available on GitHub. I call it “Leo” and it provides the basic game server and provides some interfaces and associated libraries for processing input through the server. Since I am using SignalR for client to server communication I included some code in Leo to provide a input processor and PersistentConnection. The TestConsole project was something I used to initially setup the game libraries. They are now linked into my Perenthia solution and will be updated as I find the need while working on Perenthia. The Leo source is very early stages and is subject to change frequently. It is also intended primarily for low traffic games such as iOS, Facebook, etc. I will up some instructions once it gets a little more stable. I am working on Perenthia again, doing some re-design work to try and make the game fun but also maintainable by one person, me. I am going to catalog my development journey and the design decisions made along the way. I am trying to take what I learned from the prototype/alpha stage and improve upon it with realistic goals and tasks. Since it is just me working on it, other than contracting out the artwork pieces, I need to stay focused on making it fun and trying to implement the features that I think will be fun. I have actually already started working on a re-usable library to host multi-player games. I have the basic framework in place which includes a base GameObject that provides a dictionary or properties and implements a behaviors system to allow custom behaviors to be created and attached to objects. I also have a master Game class that can be started and runs the server frame loop, updating the world and any loaded objects, behaviors or game components. I used MEF to define externally loaded components and data libraries. The Game class expects an IWorld implementation, some repositories for objects and users and optionally a list of IGameComponents. The IGameComponents are updated with each frame loop so I figured those would be good for creating things like a weather component, pack AI, etc. The IWorld is also a game component but has a few specific methods defined to access data contained within the world from the Game object. Behaviors are simple objects that can be attached to a game object and also contain and Update method that is called during the game object’s update method. All this is server side code intended to run a virtual world. In addition to the re-usable game server I have a Perenthia specific library built on top of it that defines the aspects that are unique to Perenthia itself. For instance, Perenthia contains a Skill and Race object and loads that data during the world initialization. The underlying virtual world framework is not aware that skills and races exist, just that game objects are being added, removed and updated. For data storage I put all world data that loads with the world initialization into SQL tables and a few external flat files. User and player data I am going to store in MongoDb to take advantage of the document storage mechanic and store an entire player object as one record. After using relational data for years to store objects and wiring up code to handle the relationships, etc. I find the document storage a refreshing change. I took a look at EF and code first but could not obtain the same level of ease of use as with a document store. I ended up having to code way too much logic specific to how the objects are stored rather than just saving them. I have also created a world building tool for use with Perenthia. It allows me to draw the tiles that make up the world and save them as flat files for world initialization on the server. Using ScriptSharp I also coded some logic on the client to retrieve and load the maps. 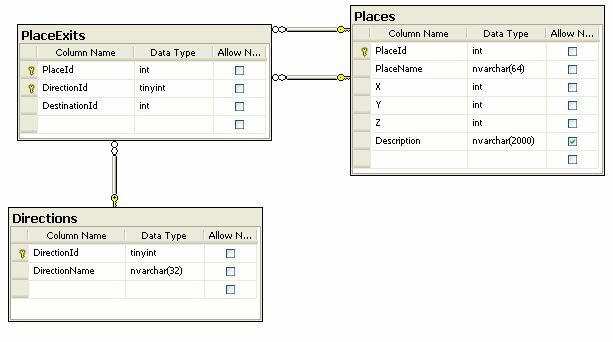 I can manage some of the SQL table stuff using the world build but want to get it to the point where I can add objects. 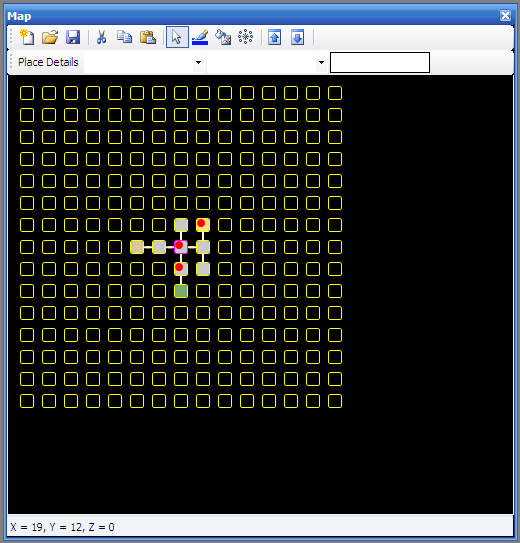 My plan is to drop objects onto the map where an object resides within a tile, so not completely to scale or anything. 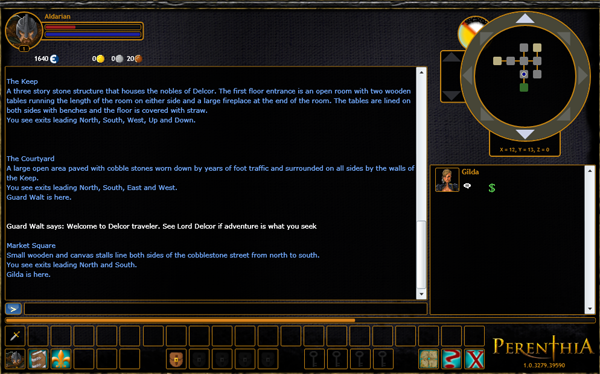 My initial thoughts are to be able to add things like shops, taverns, etc. I also want to be able to add things like trees that can be cut down or a rock quarry for mining. I just not have not gotten to fleshing out all those details as of yet but that is the general plan. What I am currently working on is randomization of creature encounters. I created a table to hold creature templates and then cataloged them by terrain. So for instance, in grass one might encounter a rat or kobold. In addition to that I created a feature in the world builder for editing creature zones. I store some zones in the database and then draw them on the world tiles to create the creature zones. So what I am working on is when a player moves onto a tile, if an encounter should happen I check to see if any creatures exist for the current terrain. If creatures exist I randomly get one with the level range marked by the zone. I am also thinking I may not return any creatures that are too low level for the player so you are not bogged down by encounters in low level areas and can move more freely into higher level areas. Once I get to where I have some decent encounters I am going to move on to the item system. Part of the Perenthia re-birth is to get the game running in the cloud on Windows Azure. I started an Azure 1.2 web role project to handle the game. I got some of the basic stuff working like authentication and character creation. With the release of Azure 1.3 SDK I had to install IIS 7.5 components. Since I did not install it previously I had to run “aspnet_regiis –iru” to setup the IIS mappings for .NET 4 and I had to install the “HTTP Redirection” component for IIS 7. After getting all that setup I am up and running with Azure 1.3. Because I am scaling the game down a bit and restructuring it to run with basic html and a variety of devices I am essentially re-building the game. I have a lot of code to work from and the concepts are already defined but I do have to do some new things. With running in the cloud some of the previous in-memory stuff I was doing has to be setup to store that in-memory data either in the database or in Azure Storage. For instance, when you connect to the game you get a token or session that identifies you. That token contains a reference to an in-memory object that stores the user id and currently selected character of the player. While I could setup and use .NET Sessions with some providers to store the data in Azure Storage I am going to continue to use the existing system I had in place and store in the in-memory data in Azure Table Storage. I have some additional in-memory data that will either scale back to database driven queries or work the same way as tokens/sessions with table storage. I have been working to modify the tool I wrote for building the Perenthia world. The tool started life as a WinForms application, migrated to a WPF application but is now a part of the Silverlight Client UI. Since all of the actions are role based and controlled with permission on the server having it in the main client UI allows me to make use of all of the framework already in place for Perenthia. 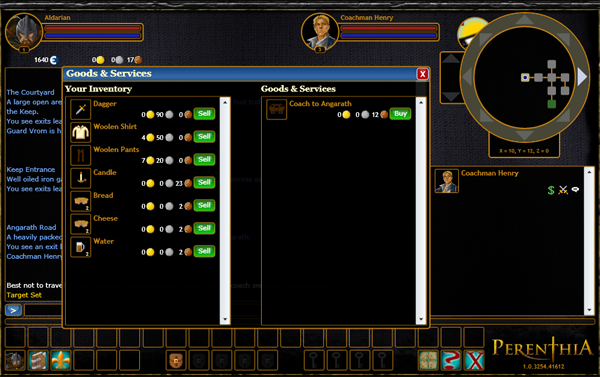 The world builder UI connects to the server via WCF services tailored for world building. What this will also give me is the ability to open up the world builder to allow users to create custom dungeons, towns, etc. Some features of the world builder are a background map of the world so I know where to place rooms, zoom capabilities that scale the map, draggable map and the ability to drag items, creatures, NPCs, etc. onto rooms on the map and configure the properties of each. /// Gets or sets the Content of the Window. /// Gets or sets the Title displayed in the title bar of the window. /// Gets or sets a value indicating whether or not the close button of the title bar should be displayed. /// Gets a value indicating whether or not the window is currently open and visible. /// An event that is raised when the window is closed. /// Initializes a new instance of the Lionsguard.Window class. // Set the Z-Index of the window to the top most position. // Prevent the mouse from moving outside the bounds of the parent canvas. /// Causes the current window to be re-z-indexed to the top most window. // Search the top most "Window" and swap z-indexes. Panel parent = this.Parent as Panel; // Panel is the base for Canvas, Grid and StackPanel. if (topZIndex == 0) topZIndex = 1; // If the value has not been set then just default it to 1. // If content is present show that as well. // If content is present hide that as well. I have been porting out the multi-player aspects of Perenthia into a separate library I hope to get up on CodePlex before too long. What the library will provide is some interfaces and classes related to handling multi-player environments. A central static class will manage connected clients and three protocol classes for HTTP, Polling Duplex and Sockets will use the static class to retrieve connected clients and push information down to them. A simple set of "tags" are used to send information back and forth and some providers allow for defining your own implementation of handling commands and encrypting data. The library will be focused on providing an easy way to get setup and implement a multi-player structure. You will still need our own game engine and associated components. As soon as I get it cleaned up a little and tested out I will put it up on CodePlex and provide a tutorial and sample application showing how to implement and use the component. I am hoping to start writing some articles about building multi-player games in Silverlight. I am planning on charting my development progress and ideas in my design and development of Perenthia. Silverlight is a great platform for .NET developers to be able to write multi-player browser based games. You get a great tool for building a UI, animations, sounds, etc. and can program everything in your .NET language of choice. Silverlight 3 is supposed to support 3D so that will open it up even more for some great games. Over the next few months, in between working on Perenthia, I am going to work on the first of a series of articles outlining how I built Perenthia. I will start with the Server component, outlining the core communication architecture and design decisions. I uploaded the Perenthia Armorial Version 1.0 to the Perenthia Alpha site tonight. The Perenthia Armorial is a way to provide external access to Perenthia information. The first version includes the Player Bar feature, where you pass a player name to the service and renders back HTML with player details. I did a Character Creation, Movement and Chat test last night with the Perenthia Alpha players. The tests went well, I chatted with a few players, found some bugs and was very encouraged by the whole thing. The next test should start next weekend and will include some combat/spell tests. After that we will do some questing tests, travel tests (boats and stuff) and then I will open up more of the world for the alpha players to help resolve other issues not covered by the main feature tests. I am enjoying Silverlight as the client UI, it provides a Windows like interface with ability to be run in a browser. While developing Perenthia I tried several different communication formats from sending JSON serialized objects back and forth to sending byte arrays containing mostly integers indicating what should be loaded and displayed, what commands to execute etc. What I eventually settled on was a bit of a hybrid. I've created a simple set of "tags" that can be sent to and from the server. The tags are nothing more than pipe delimited strings contained within curly braces and there are a limited number of tags that provide simplicity yet flexibility with the data that is transmitted. 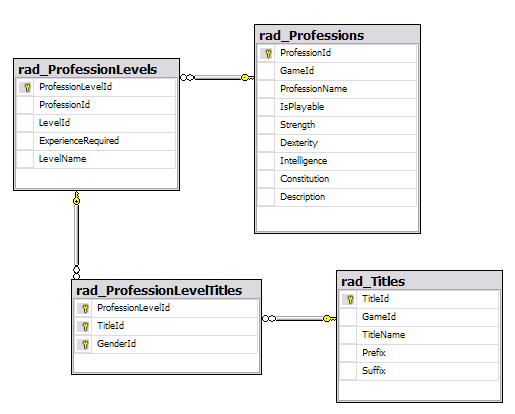 The tags are represented in C# by tag objects allow me to create them, query them, etc. I wrote a custom tag writer class that parses the tag objects into strings to be sent to the client and likewise a tag reader that reads the strings sent from the client and parses them into tag objects. The client can find and parse the player tag and then find the properties associated with that player instance. The way the server works now it will send the full player tag once logged in and a character is selected and then from then on out it just sends property updates. For my PBBG Engine I am developing a command processor independent of the client interface. The reason for this is that I want to be able to build different interfaces such as a mobile interface, silverlight and/or flash interface. I want all the interfaces to process the same commands and be able to handle the same output from the server in order to update the UI components. Where CMD would be the command to send to the server and the AUTHKEY would be a key generated when the player logs in through the authentication service that uniquely identifies the player for that session. The response from the server will be JSON formatted objects and I still have not figured out the complete structure yet. The things I need to send back to the client would be: An array of messages to display to the player, player's new position should they move, the player stats when in combat, their current target and any other players or mobiles they encounter. Could end up being a large set of data for certain actions so we'll see about performance there. One of the main things I am concentrating on for Perenthia and my PBBG Engine is performance. A lot has to go on in a game, each action be it movement, combat, etc. causes a lot of code to be executed and database calls to be made. What I am striving for in Perenthia and ultimately in my PBBG Engine will be as few database calls per command as I can get away with. Right now Perenthia makes several calls, one to load the Character and depending on the action 1-4 more database calls and then the final save Character call. For Perenthia, I was able to get movement into the Character load call, then make one call to determine if the player can move and if any monsters are encountered, then a final call to save the character. That is probably as small as I can get movement but it still does not perform the way that it should. Attack is another performance bottle neck that I plan to devote some time to once I get the map movement sped up. In between updating Perenthia and adding new features I have been pulling parts of the code base into a more generic PBBG Engine I am writing in C#. I started working on it when I upgraded the Knights of the Realm game and used parts of it for Perenthia. I am hoping to put Knights of the Realm Beta 2 on the new engine once I get it finished. I am building the engine as generic as I can but it will incorporate a base rules set and some basic concepts. The base objects will be Avatars, Places and Things. These objects will contain the properties required to function within the rules set and all objects will derive from a base GameObject class that will provide a properties collection for creating custom properties on derived game objects. The game will be driven by commands sent from the client. Some objects will handle the commands in the engine framework while other commands will cause events to be raised that deriving implementations can handle and provide custom execution or additional execution of the commands. The egnine will basically be a commands/rules processor that I will hopefully be able to build a variety of games on. I have plans and ideas for several types of games and do not want to continually build the same thing over and over, hence the PBBG engine. I ran into a major performance issue with the ASP.NET AJAX Server Controls while testing my persistent browser based game Perenthia. 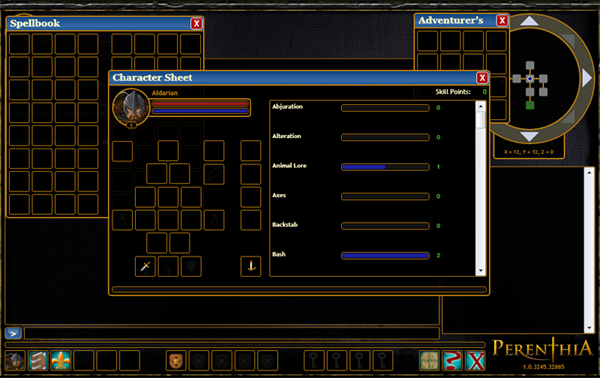 I had initially used update panels fro the various regions on the main game interface such as the player stats, map and chat window. Programming this was simple as I could do everything in the server side code and just send back the results. With the partial page rendering feature of the ASP.NET AJAX Extensions only the update panel html was sent back to the browser. Once I moved the application into a production environment and had people on there playing and testing the web starting running out of memory, the application was consuming the server memory at an alarming rate. What was happening was that IIS would jump 1 to 2 MB of RAM for each request made by the client, that means every time someone moved on the game map 1 to 2 MB of RAM were being held and not released. I tried a bunch of different stuff from optimizing stored procedures to caching the map data but none of it helped. I used Firebug to watch the AJAX request and response and to see if I could reduce that down some. The response was simply HTML fragments so I wasn't too worried about that but the request sent the entire ViewState up to the server with each post. The ViewState for the game page could be quite large since I was appending messages to the chat window which was a server control. I was able to eliminate the ViewState issue with the chat window but the app was still consuming RAM and not releasing it. In conclusion, while the AJAX Server Controls might work great for most web sites they are definitely not optimal for a persistent browser based game (PPBG). I am hoping to release Perenthia around the end of August. Everything is mostly complete and ready to go, I have a few UI element issues to work out and then the game will go live with a public beta.